This page describes how technology and research works in the game. If you want tips or advice, check out the Technology guide. Note that this page only applies to civilized nations. For information about how technologies work for uncivilized nations, see Uncivilized nations. If you click the Technology tab on the top bar you will open up the Technology interface. 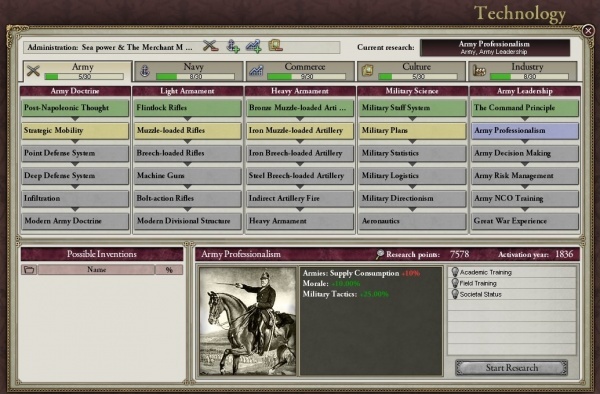 At the top left of the Technology Interface you can see your Research Administration type (commonly known as tech school) and what bonuses/penalties it is giving you. Next to that, on the top right is the technology you are currently researching, if any. The bulk of the window is taken up by the technologies. There are a total of 150 technologies in the game, divided into 5 major categories. Each major category is further divided into 5 subcategories (with 6 technologies each). There is a progress bar underneath each major tech category that indicates how many technologies in that category you have already researched. You can only research each subcategory linearly, from least advanced to most advanced. Each technology requires a number of Research Points to complete. These are added each day, according to your current Research Points (see bellow) until the technology is fully researched. If you click on a technology the bottom right panel will explain what the technology is and how it may help you (including the inventions it will unlock). At the bottom left there is a panel that shows the possible inventions that your technologies have unlocked, but which haven't triggered yet. Technologies are also color-coded. Green techs have already been researched. Yellow techs are available to be researched. Grey techs cannot be researched yet. Blue tech is the one being researched at the moment. A country's Research Administration (tech school) determines what bonuses and penalties it gets to the Research Point cost of researching different tech categories. As you research new technologies, they will open up possible inventions which can add still more effects to your country's advantages in combat, economics etc. When you click on a specific technology in the technology interface, you can see all the inventions it unlocks in the bottom right corner. Once you have researched the technology there is a small chance each month that one of the inventions it unlocked will trigger. All the inventions that your technologies have unlocked but which haven't triggered yet can be found in the "possible inventions" panel at the bottom left corner of the Technology Interface. This will show you the inventions names as well as the percentage chance that they will trigger each month. You can often affect the chance by researching other technologies or otherwise changing aspects of the nation. Hover the mouse over the inventions' percentage number and the tooltip will show the base chance as well as how to increase/decrease it. The amount of research points from literacy is 4 * literacy% with a maximum of 4 RP with 100% literacy. Only the literacy of pops living in full states (not colonies or protectorates) is considered. The amount of research points from clergymen is 1.5 * clergy% with a maximum of 3 RP if 2% of the population are clergymen. The amount of research points from clerks is 0.5 * clerks% with a maximum of 2 RP if 4% of the population are clerks. Before encouraging clerks for research, bear in mind that a pop must have at least 50% literacy to promote to clerks. The plurality multiplier is 0.02 * plurality% with a maximum multiplier of 2 at 100% plurality. The technologies in the Philosophy subcategory (under Culture technology) each give a multiplier with the first three techs giving a multiplier of 0.5 each while the last three techs give a multiplier of 1 each for a total multiplier of 4.5 with all six of the technologies. Some nations can gain research modifiers and outright research points through decisions and events, like the the Swedish Folkskolereformen decision. Universal decisions and events can also give research modifiers and points. Puppets If you are a puppet, you will get a 50% bonus when researching techs that your master has already researched. Thus the total maximum daily research points (without events and on normal or higher difficulty) is: 10.5 * (1 + 2 + 4.5) = 78.75 RP. If no research goal is selected then it will be stockpiled up to a year's worth of RP. The amount currently stockpiled can be viewed by hovering the mouse over the RP number in the top panel. The pool is spent at a rate of 100/day once a technology is selected to research, and civilized nations can stockpile up to one year's worth of research. In vanilla RP has no limit and is spent at a rate of 1000/day. This page was last edited on 11 July 2018, at 21:37.